Copyright: � 2011 Brown et al. This is an open-access article distributed under the terms of the Creative Commons Attribution License, which permits unrestricted use, distribution, and reproduction in any medium, provided the original author and source are credited. The Tasmanian devil (Sarcophilus harrisii), the world抯 largest marsupial carnivore, is under threat of extinction following the emergence of an infectious cancer. 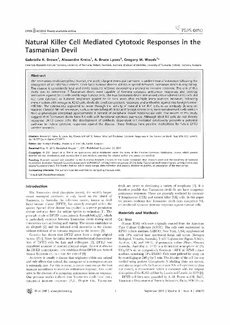 Devil facial tumour disease (DFTD) is spread between Tasmanian devils during biting. The disease is consistently fatal and devils succumb without developing a protective immune response. The aim of this study was to determine if Tasmanian devils were capable of forming cytotoxic antitumour responses and develop antibodies against DFTD cells and foreign tumour cells. The two Tasmanian devils immunised with irradiated DFTD cells did not form cytotoxic or humoral responses against DFTD cells, even after multiple immunisations. However, following immunisation with xenogenic K562 cells, devils did produce cytotoxic responses and antibodies against this foreign tumour cell line. The cytotoxicity appeared to occur through the activity of natural killer (NK) cells in an antibody dependent manner. Classical NK cell responses, such as innate killing of DFTD and foreign cancer cells, were not observed. Cells with an NK-like phenotype comprised approximately 4 percent of peripheral blood mononuclear cells. The results of this study suggest that Tasmanian devils have NK cells with functional cytotoxic pathways. Although devil NK cells do not directly recognise DFTD cancer cells, the development of antibody dependent cell-mediated cytotoxicity presents a potential pathway to induce cytotoxic responses against the disease. These findings have positive implications for future DFTD vaccine research.